An early development build of next version of Microsoft Office productivity suite to succeed Office 2010, codenamed Office 15 as it will be version 15 of Office series, has been leaked. Office 15 is widely believed will be released in 2012, making Office 2012 a candidate for its official name. 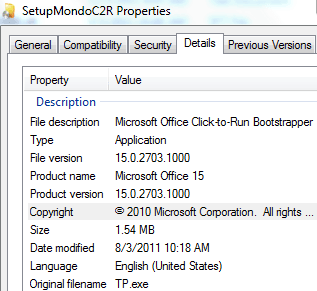 The leaked build of Office 15 is from Milestone 2 (M2), and has the version number of 15.0.2703.1000. From the setup file’s properties, the build is believed to be compiled on March 8th, 2012, where Office 15 officially entered M2 phase early March with build 15.0.2621.1000. The next Office 15 features Moorea, an application looks like to be a clipboard for any type of content including text and images. Its tagline is “everything you need in one place”, so the features and functions of Moorea can be expanded when it arrives in final form. Moorea 15 is installed but not linked via shortcut in this build. Anyway it’s easy to unlock and enable Moorea. There is also a Microsoft Lime application to test UI elements. Several enhancements and improvements have also been made to individual Office 15 applications of Excel, Word, PowerPoint and Visio. For example, ability to import data via Atom feed, new conversion support between numbers and Roman alphabets, ability to insert online video and audio and etc. Otherwise, Office 15 is still very much looks like Office 2010. The main visibly enhancement expected in Office 15 is likely to be incorporation of Metro UI as core design theme, which first used in Windows Phone 7 and Zune, and is also anticipated to include in upcoming Windows 8. 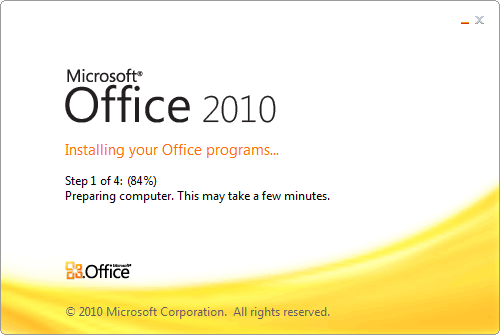 In fact, the setup installer of Office 15 still prominently display that it’s installing Office 2010, despite after installation the application is called Office 15 (O15). Note: Only 32-bit (x86) version of Office 15 M2 is leaked. The leaked Office 15 M2 build is still very buggy, so DO NOT use it to replace your Office 2010 or Office 2007, and use at your own risk. It can be installed on Windows Vista and Windows 7, but not Windows 8 though. The system requirements is similar to system requirements of Office 2010. After downloading, extract the ISO archive and run the SetupMondoC2R.exe to install Office-Next version 15. After installation, you may choose to activate Office 15 with KMS activator. 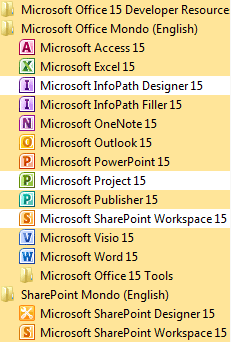 The leaked Office 15 uses Click-to-Run (C2R) and App-V technology (something like virtual drive that’s why you will notice installation is completed in fast and furious manner), and contains full set of Office 15 applications, including Access 15, Excel 15, PowerPoint 15, Word 15, Outlook 15, Visio 15, InfoPath Designer 15, InfoPath Filler 15, Project 15, Publisher 15, OneNote 15, SharePoint Workspace 15, SharePoint Designer 15, and various other tools.